Olivedale Guest House limits bookings to 3 or more days. Small Double room, can be let as single. Private shower room across the landing (for lavender room only). Pleas note this is our smallest room. All year daily price £35..00 p.p.p.n.based on two sharing. 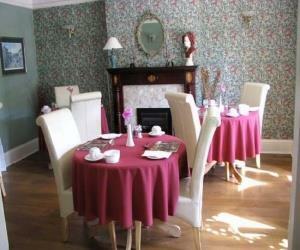 £60..00 per night for single occupancy £10.00. per room supplement for one night. Lavender limits bookings to 3 or more days. Twin can be let as a single single room. All year daily price £33.00-£43.00 £10.00. per room supplement for one night. Sage limits bookings to 3 or more days. Olivedale is a tastefully modernised Victorian house with pretty gardens. Peacefully located yet only minutes from the sea and town centre. Offering excellent accommodation including a luxury king size suite with large bathroom. Ideally suited to couples. A warm welcome guaranteed. Sheringham is off the A148 Kings Lynn-Holt-Cromer Road. On entering the town via the A1082 Holway Road, you will approach a roundabout. Go straight across into Station Road. At the bottom, turn left at the theatre, take the first right into Augusta Street. Olivedale is 30 metres on the right.